The all-new 2019 Ram 1500 can handle all the heavy lifting. 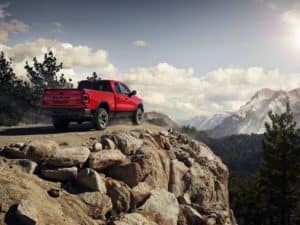 Whether you have a tough job to get done at work or want to make a full-size pickup your own at home, the Ram 1500 can be just the right fit for life in Chicago and Skokie. 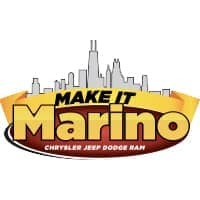 The Marino Chrysler Jeep Dodge Ram sales professionals have put together this review so those in Park Ridge and Forest Park can learn more about what this truck has to offer. Keep reading to become more informed about performance, towing, interior features, and more. Gaze at the exterior of the 2019 Ram 1500 and the first thing you may see is the new grille and sculpted front of the truck. Once you’re inside, though, you’ll truly feel what’s powering it. The Ram 1500 comes with a standard V6 engine, which delivers 305 horsepower. The available 5.7-liter HEMI® V8 produces 395 horsepower and 410 lb-ft of torque. This engine can be upgraded to a mild hybrid system, which helps save fuel. When properly equipped, the Ram 1500 can tow up to 12,750 lbs. and haul up to 2,300 lbs. The large brake rotors measuring nearly 15 inches front and back, paired with the heavy-duty shocks, bring premium ride quality each time you’re behind the wheel. With over 100 standard and available safety features offered in the all-new Ram 1500, you’ll certainly feel protected while navigating the roadways. The all-new blind spot functionality along with Rear Cross Path and Trailer Detection feature is able to sense just how long an attached trailer is. It’ll let you know if the trailer is getting too close to other cars on the road. Another one of the new available features is the 360-degree surround-view camera. Cameras are mounted on the front, rear, and side mirrors. You’ll have a better idea of what’s happening around the truck before making that next maneuver. Technology seems to follow us everywhere these days, whether it’s our phones, tablets, or even smart home accessories. Owning a truck that’s tech-ready only seems appropriate. This one comes with the Uconnect® system and a 5-inch touchscreen. The available Uconnect® 12.0 with a larger 12-inch touchscreen offers split-screen capability, with controls for music, temperature, and navigation. It’s simple to use and easy to interact with. The available 7-inch digital information display cluster provides a range of vehicle data right in front of you. Check mileage, outside temperature, and trip data without taking your eyes off the road. Does sound quality matter to you, too? The available Harman Kardon® 19-speaker powerhouse makes songs new and old sound great. Visit Marino Chrysler Jeep Dodge Ram to take the all-new Ram 1500 for a test drive. Our sales team assists Chicago and Skokie drivers every day, along with those in Park Ridge and Forest Park. Check out the current Ram 1500 inventory online, or stop by the dealership. We look forward to helping you find your next vehicle.